A major concern leading up to the Disneyland Half Marathon weekend was how I would properly fuel before, during and after the races that made up the Dumbo Double Dare challenge. Each hotel at the Florida resort has multiple food service areas, plus there is a plethora of restaurants in each of the parks. Getting nutrition with a variety of offerings is easy in Florida, and the selections have gotten exponentially better year after year. Disneyland, however, is more of a locals' resort. With many of that park's guests coming from the South California region, I thought there would be less of a need for many dining options for the guest who only comes for the day. Man, I was wrong. When I'm in the parks for a race weekend, I don't normally tackle major meals often. Instead, I attempt to keep my energy levels up by snacking throughout the day. 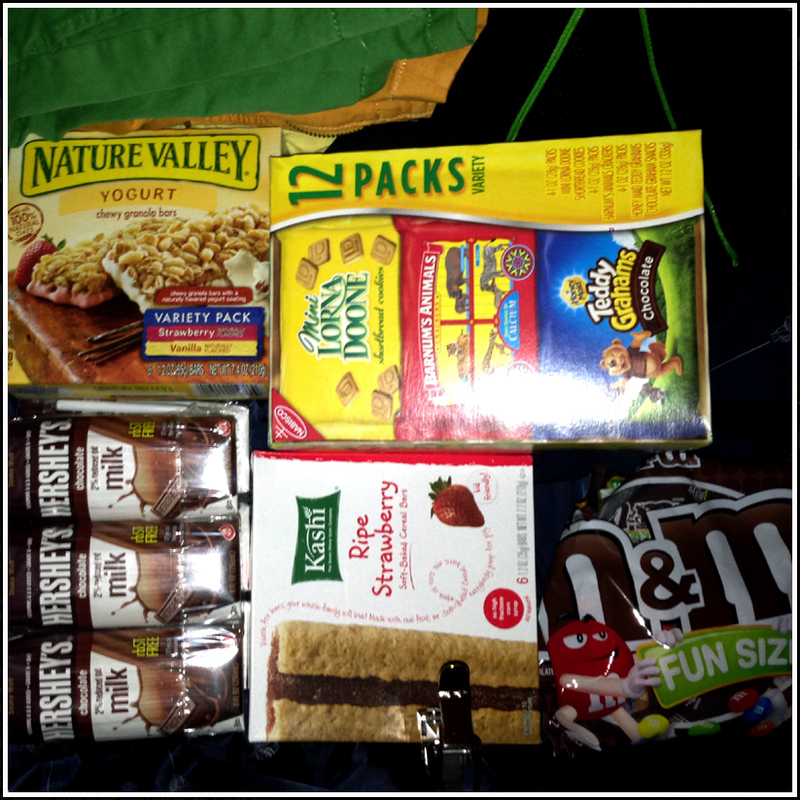 Before heading to Disneyland, I packed my suitcase with healthier snack options for the hotel. Animal crackers, granola, breakfast bars, and shelf-stable chocolate milk were on hand for quick items to have when we were on the go. They also came in handy pre-race for breakfast and post-race when I was ready to inhale anything in sight. This was a great plan, although if you're strapped for suitcase space, there are options surrounding the park to purchase items on race morning and throughout the weekend. Also, in the parks I saw many stands serving healthful options that are runner friendly. With the Southern California location comes access to fresh produce which can be found in abundance. Everywhere had pineapple spears, fresh cut apples, yogurt, sandwiches and milk as options for diners. The days of only burgers and chicken tenders are gone, but they are available if that's what you're craving. When it came time to get a meal with the intent of fueling and carb loading for race morning, the options were plentiful. 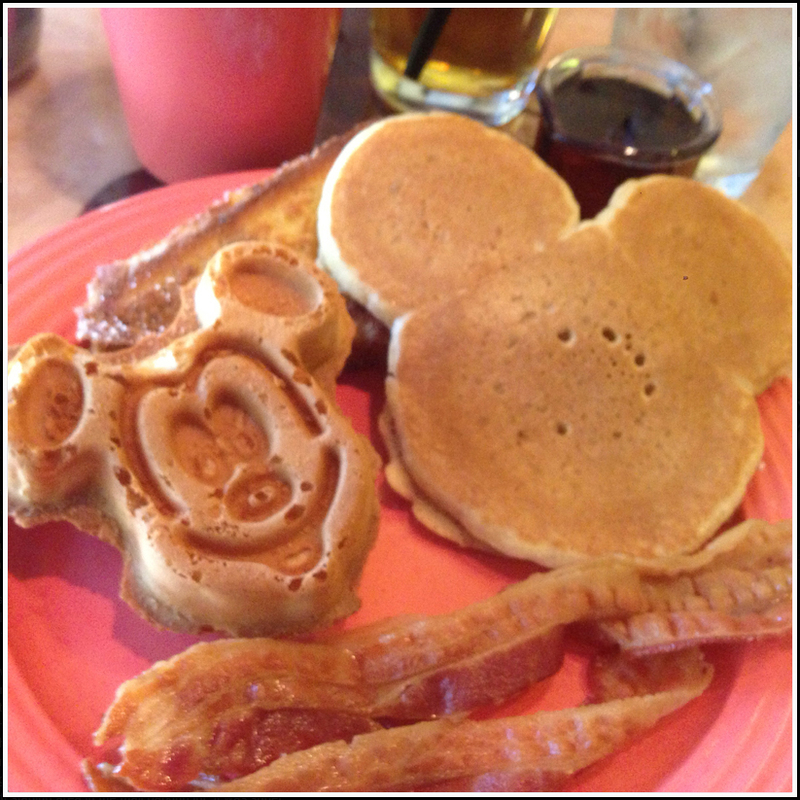 Downtown Disney has many dining options available for the runner and their weekend companions. 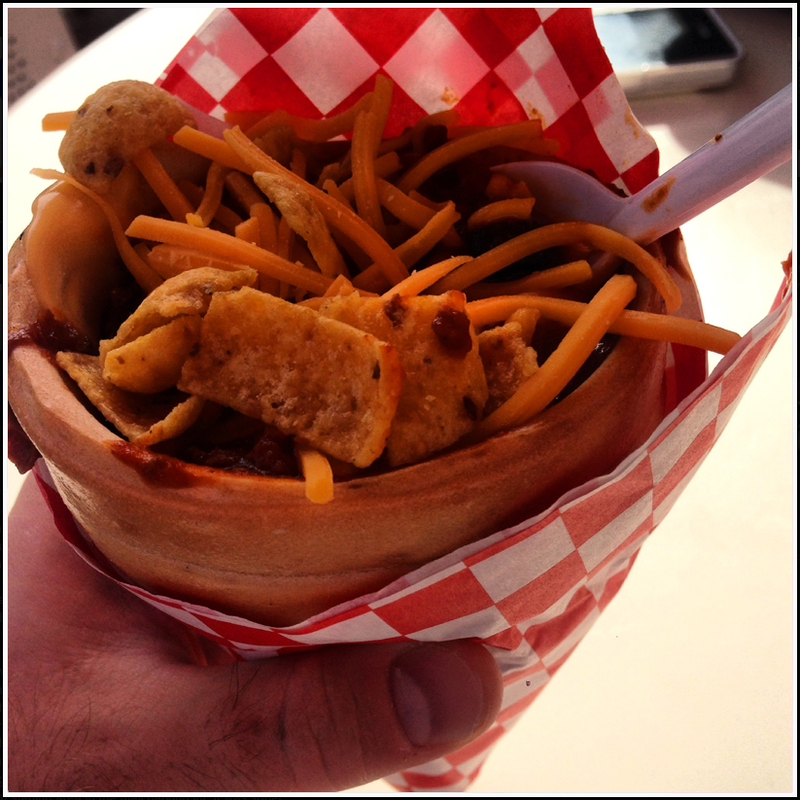 The night before the Disneyland 10K, Karen had made reservations at Tortilla Joe's. 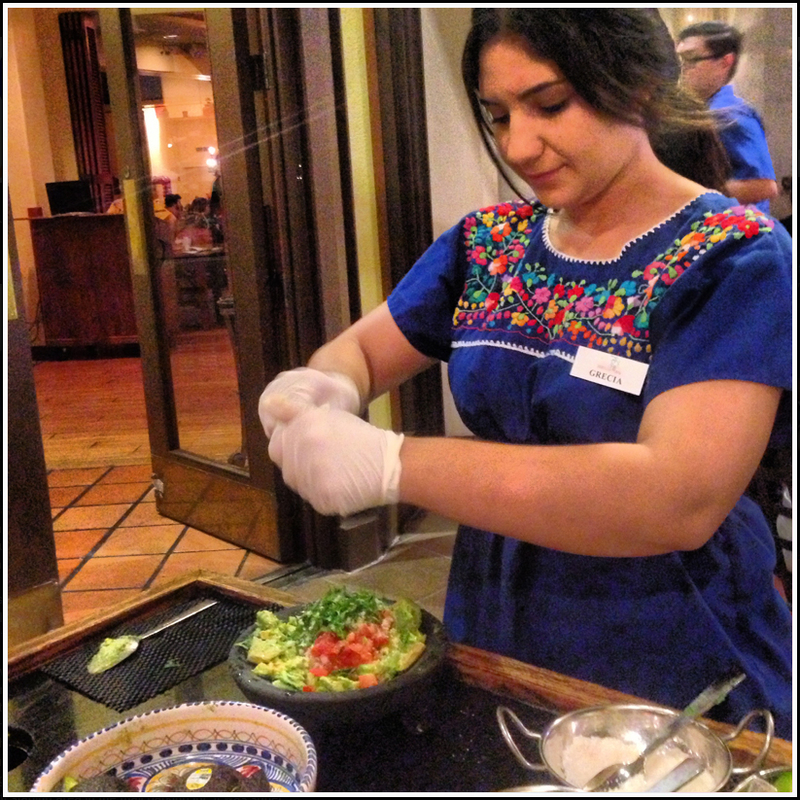 They featured guacamole made tableside and fajitas that we shared. We passed on the margaritas, knowing that runDisney's nutritionist Tara wouldn't approve. However, I had several tortillas remembering that during the meetup she mentioned that carbs come in many forms. The night before the half marathon found me much more hungry after a full day of running and having fun in the parks. Karen, being the planner that she is, had made reservations in California Adventure for the Wine Country Trattoria. 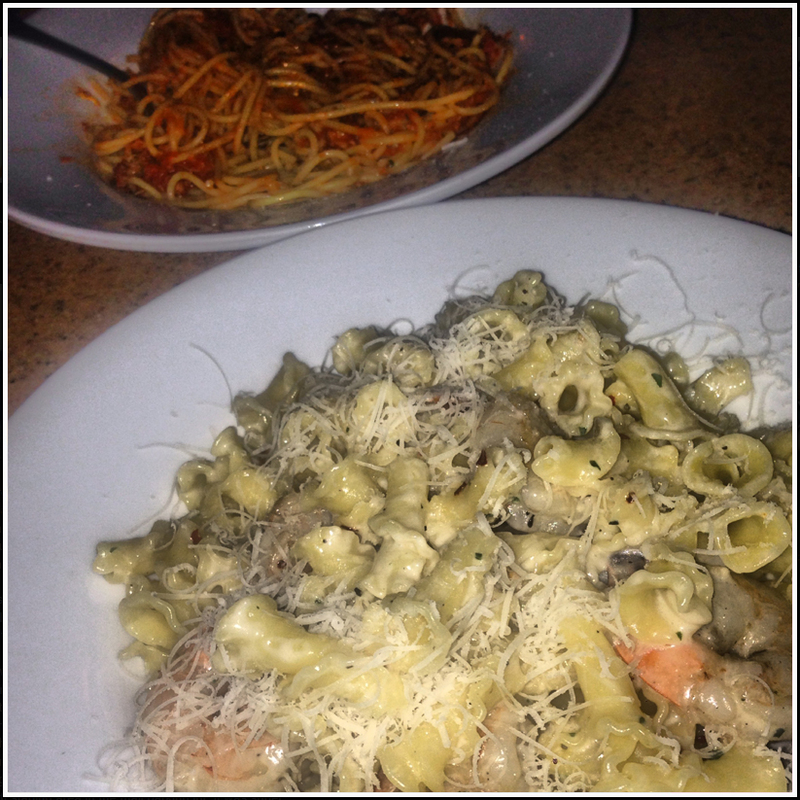 We had numerous pasta options to carb load, along with a full menu of salads and appetizers. 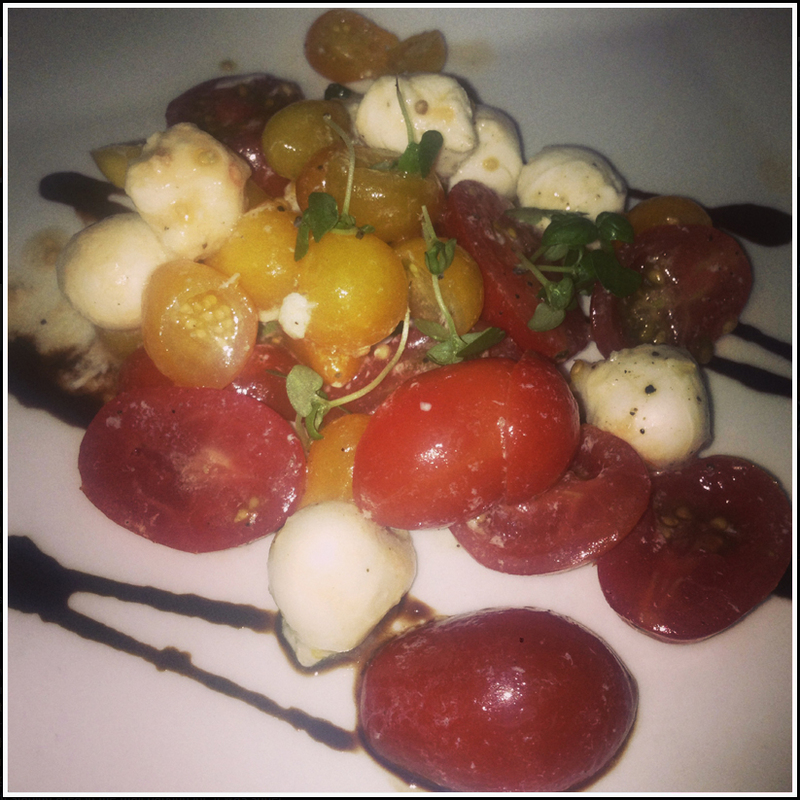 We shared the best bruschetta I've ever tasted along with a caprese salad. Each of us ordered a pasta dish, with mine being a lighter white wine based shrimp pasta. I could have gone lighter on the cheese (its grated tableside), but I encouraged the waiter to be generous. The meal was fresh and delicious, and more than filled me up for 13.1 miles. Dining at this restaurant during certain times comes with passes for special viewing access to The World of Color water show. See a video excerpt from the amazing show below. 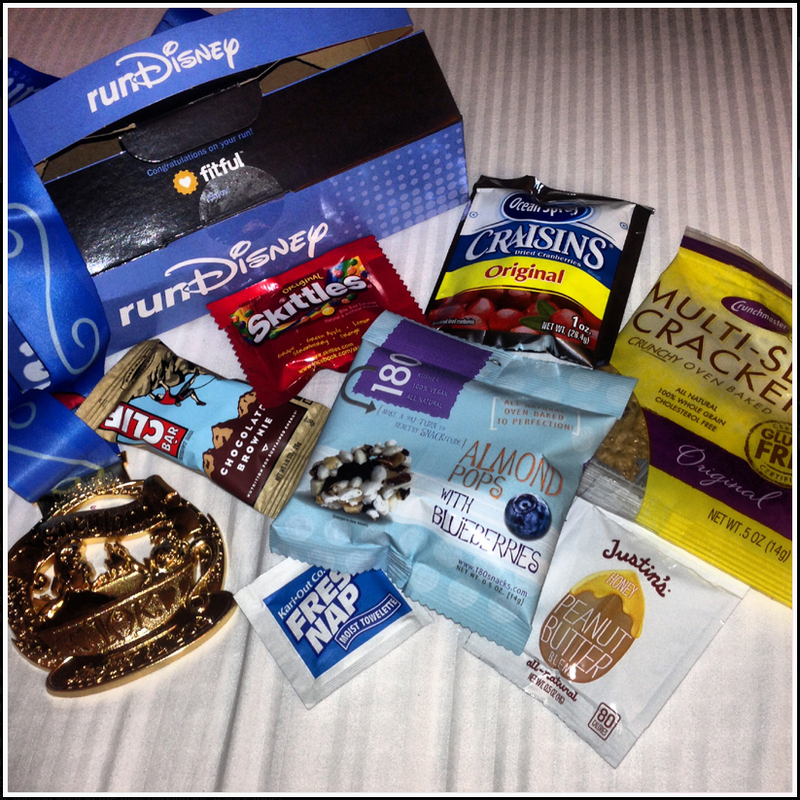 At every runDisney race I've done over the past couple years, race organizers have put together boxes of sample sized food items to hand out to finishers. The boxes contain crackers, spreads, dried fruit, Cliff Bars, cookies, etc to replenish the nutrients runners burned during the race. In addition, there is fresh fruit (usually bananas) and fluids (water and Powerade) handed out separately. Karen inhaled her snacks immediately following the 10K, and was ready to tackle more. The entire walk back to the hotel, I kept looking over my shoulder to see if she was about to gnaw off my arm. The items in these boxes are not intended to be a meal, but instead meant to put something back in to runners in the time immediately after the race. That being said, I long for the days when runDisney handed out bagels and blueberry muffins after their races. One requirement when planning a runDisney vacation is including a character dining experience. 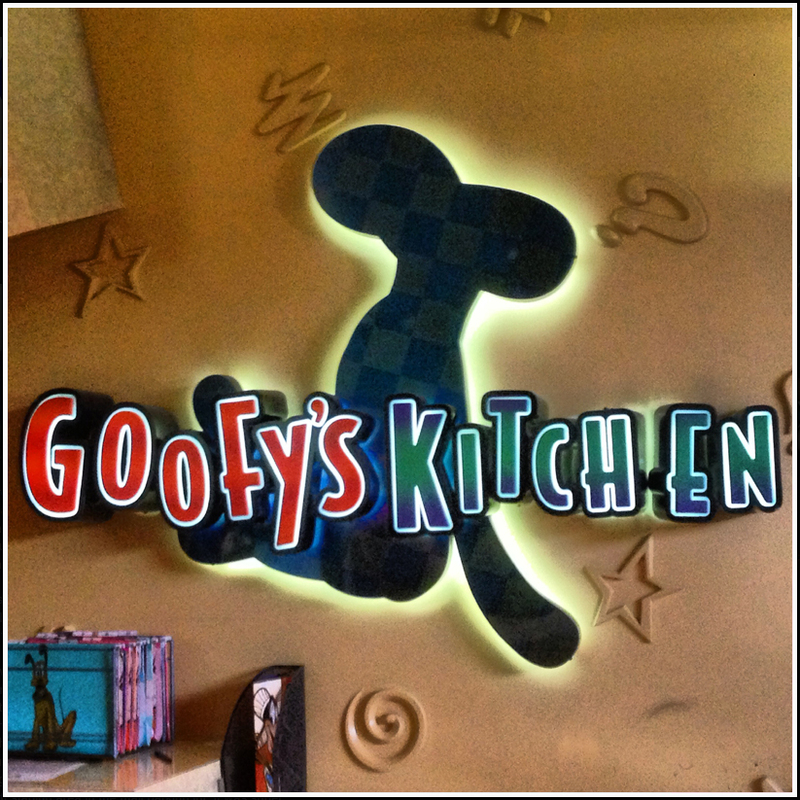 Disneyland has much fewer options for these venues, and I was nervous about what awaited us when we arrived at our reservations for Goofy's Kitchen in the Disneyland Hotel two hours after finishing the half marathon. What I found was a brunch buffet with all of my breakfast favorites being served along side the most eclectic mix of Disney characters I've ever encountered. 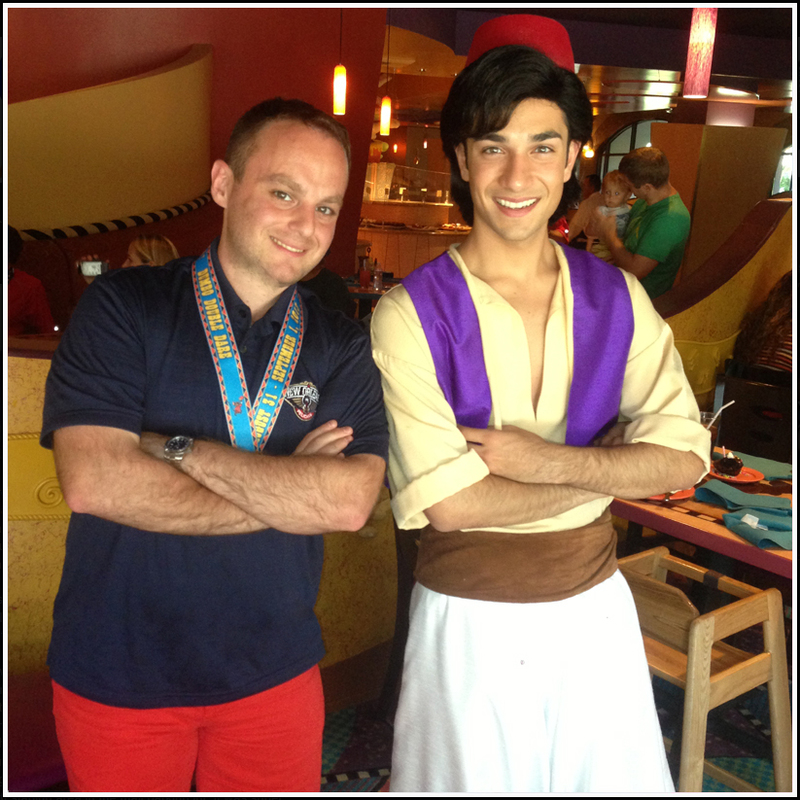 Aside from Goofy in his Chef's coat, we met Aladdin, Mulan, Pluto, the Mad Hatter, Chip & Dale, Rafiki, and Gideon. We had ample amount of time with each character who rotated on the dining room floor, with many stopping multiple times for conversations and photos. The staff was superior, and even came out to sing happy birthday to me (complete with chocolate cupcake, candle, birthday pin, and buttons for the table). I can't think of anywhere in Walt Disney World where you can get this fun, unique opportunity. I landed in Anaheim with several food items in mind. The Disney parks have unveiled new food items over the past several years, with many being specific to the west coast. The introduction of Cars Land brought the Cozy Cone Motel and the Chile Cone Queso, Paradise Pier midway has one of the best corn dogs around, and cream cheese stuffed pretzels make a great snack before closing down the parks. I also had to have the obligatory churro and Mickey ice cream sandwich, which make every Disney trip complete. These items are saved for when racing is done, but there is time remaining before returning to reality. Yes, The Food at Disney deserved a post all of its own. My personal favorites from Disney are the Mickey Waffles and Ice Cream bars. Classics but a must every time. There's something about biting the ear off a Mickey ice cream sandwich that makes me giddy. Same thing with the waffles. For being a New Orleanian in a New Orleans themed restaurant, I was pretty pleased with the food. It was all really good, even if it wasn't necessarily something I'd order in New Orleans! I hear they do Mickey shaped beignets, and I wish I would have seen those. Definitely something to order when I go back. oh yes! I forgot about the Beignets!! Sounds like a perfect breakfast stop to me! Here are blog posts I found just on those alone! A MUST try on my list! Ill send you a pic on Twitter lol! Apprx 65 days and counting! I do need to check and see if there are any "must do" dining reservations. Trader Sams is on my list. I need to see if that place requires reservations.